I purchased this from lucky mojo and started wearing it in my left shoe or pocket. Then i put pinches of it in the four corners of my bedroom. The gossip and backbitting amongst my sisters and friends have cut down tremendously! My younger sister have been giving me the blues with her jealousy and backbitting against me for years and she caused petty wars and tries to get all her friends and family members to be angry at me for no reason. Im so glad I order the "Hoodoo Herb and Root Magic book! Reading this site in general makes life so much easier. The air is not cut with tension anymore when I have to visit my younger sister anymore, or other family members it's sooo peaceful!!! Great testimony! See the page on one more step you can do with Slippery Elm. Psalm 37, see above link to "Hoodoo in Theory and Practice", by Miss Catherine Yronwode. Good luck and Be Blessed! I agree with Miss Tammie Lee. Its nice to hear the results of spellwork. 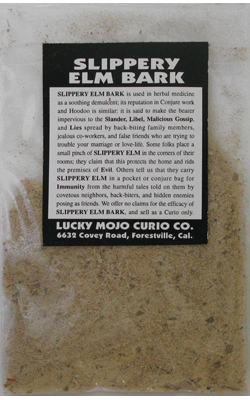 I understand slippery elm bark is a herb that is generally used to stop gossip, with that being said, i am trying to once again reconcile with my lover. (new argument ) my question is: would it be feasible to load a red skull candle with love herbs at the bottom, his hair, a petition, and put slippery elm bark in the mouth of the skull.. that by using the slippery elm bark, he would stop speaking/venting/gossiping about our problems, and reconcile with me.. or should this be done in two separate spells? *I understand it is "normal" or common for people to vent/gossip to their friends when they are having problems with their lover, but i feel like this often causes more fights, so that is why i wanted to add slippery elm bark to a red skull candle with love herbs. This product qualifies to be included in the Lucky Mojo 6 Herb and Root Special. 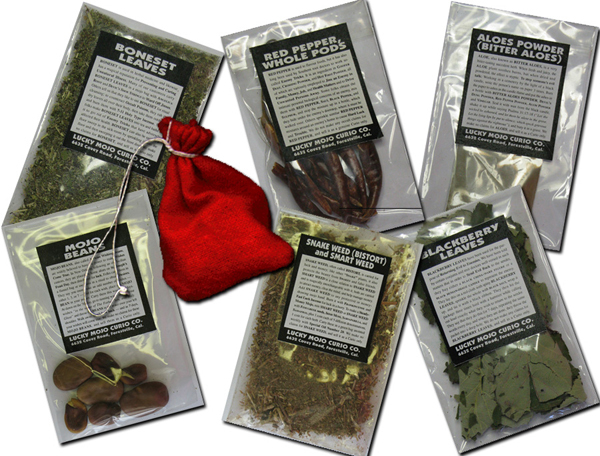 When you order SIX of our regularly-priced herbs or roots, you only pay for FIVE and, as a BONUS GIFT -- we will also send you a FREE Red Flannel Bag that you can use to make your own mojo hand. Just order the Special, and be sure to list your SIX herbs and roots in the message area of your order.